Saw this saying on a T-shirt once and it came to my mind when I photographed this picture during a beautiful sunrise last week at the Xtan Ha Resort located in North Ambergris Caye, Belize. I have gotten accustomed to getting up very early to witness the beautiful sunrises that we are blessed with here in Belize. This couple had one of the best views of this sunrise, or might I say that they had the PERFECT viewing spot to enoy the sunrise. 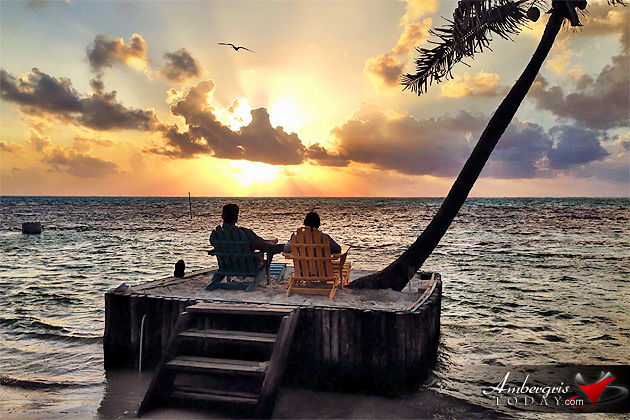 Two lovers holding hands and experiencing one of the best pleasures while vacationing in San Pedro, Ambergris Caye; it cannot get better than this! - Dorian Nunez.